Boat building has ancient traditions. 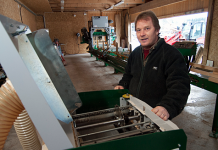 Lars Wigren belongs to the growing number that carries the traditions on with the help of an own sawmill. 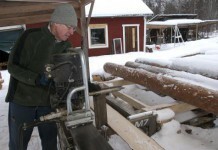 Lars had built a lot using timber from his own forest. As retirement was approaching, he saw an opportunity to realize a dream. “As long as I can remember, I have dreamt of building a boat,” says Lars. As newly retired he took a course in boat building, and became extra interested when he found a drawing for a Norwegian rowing boat in the course material. Everything fell into place, and he rented a place to build his own rowing boat in. The first model became such a success that family and friends wanted boats too, and since then still more boats have been made. “I charge for the material, but I do the work just for fun. I wouldn’t be able just to sit down and do nothing,” he says. The rowing boat of solid wood bears a visible kinship with 1000-year-old Viking ships, clinker-built with curved strakes (the planks on the sides of the hull). There is no doubt that this is more than preserving knowledge of the crafts of the old times; building a rowing boat using traditional methods, is a cultural achievement. 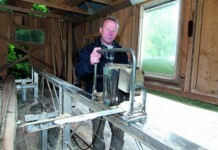 To succeed in doing this, the Logosol Sawmill is more or less a prerequisite. 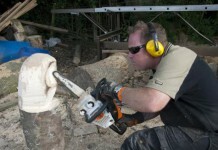 You cannot find the right dimensions, and buying custom-made timber becomes unreasonably expensive. 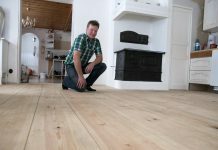 “The planks are 18 mm thin and 250 mm wide before planing. 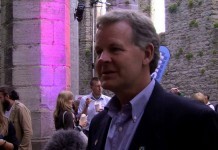 Those dimensions are not available to buy,” says Lars. The width is a prerequisite for making the curved shape at the bow. When the timber has been planed on both sides, it is 13 mm thin and so flexible that no steam bending is needed. “The logs are so heavy that if I hired someone for sawing the timber, I would need helpers and a tractor for transporting the logs. 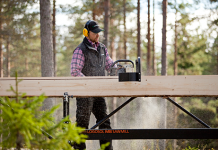 Now I carry the Logosol Sawmill to the trees, saw the timber on the spot, and manage to do the entire job by myself,” says Lars. He makes the bow and the stern of pine heartwood. The boards, however, are made of spruce, a material that in the boating world is considered as sensitive to rot, but with traditional treatment it works perfectly. The inner side of the boat is steeped in linseed oil. The outside I s treated with a mixture of tar, linseed oil and turpentine. This treatment makes the boat excellently stand the brackish water of the Gulf of Bothnia.